Whether you are a hiker, backpacker, camper or just an outdoor explorer, there are bound to come times when the weather turns ugly. The mountains, in particular, are notorious for surprise afternoon storms; one minute the sun can be shining brightly, and the next can bring dark, ominous, gathering clouds that can rapidly produce torrential downfalls, hail and snow. Many outdoorsmen love the mountains for this unpredictability, but if you are going to be out in these elements—either accidentally or on purpose—you will need to possess the proper inclement weather gear and apparel, including an all-purpose pair of quality rain pants. To help better prepare for you for your next big outdoor storm, below we will provide a general definition of rain pants and their potential purposes. We will also show you how to choose the right rain pants for you by listing the various things you should look for and consider when shopping for the best rain pants for the money. As the name suggests, rain pants are a type of lower body outdoor apparel designed to keep you warm and protected from the rain and other inclement weather conditions. Rain pants can either be worn alone, or on top of your regular hiking pants. These pants come in a variety of sizes, materials/fabrics and weights, and most have built-in coatings or membranes to help ensure they are 100 percent water proof. When you set out to buy any type of clothing, you should always consider how, why and where those clothes will normally be worn. This will give you a better idea about what to look for when purchasing these clothing items. The same goes for rain pants. With these apparel items, you must consider what is most important to you (protection, comfort, etc), and then set out to buy a pair that offers all of those things you need. Water Wicking. Crucial in any clothing that will be worn in wet weather, and with any piece of clothing that will touch the skin, water wicking is a fabric’s ability to pull moisture (rain, sweat) away from you and move it to the fabric’s outer surface, where it can dry quickly. That lets you break a sweat while hiking without feeling clammy or chilled. Breathable. Imperative in a pair of quality rain pants, breathability is a quality that helps your wicking layer dry out more quickly. When your layers don’t collectively breathe, then perspiration that’s wicked off your skin dries inefficiently and you can end up getting soaked by your own sweat. Insulating. The mid-layer of your rain pants should be insulated so as to keep you feeling warm and protected. No clothing can actually “produce” heat, but your body can. Thus, rain pants that are insulated help you maintain and retain the heat your body is producing. Waterproof. Rain pants that are waterproof will not allow water to penetrate the outer shell of the pants. Keep in mind that water resistant clothing is not the same as waterproof clothing. Water resistant clothing only offers moderate protection from the rain and other water sources, while waterproof clothing is specially designed to “block out” all water. Windproof. Like with waterproof, windproof rain pants will prevent the wind from whisking away the heat produced by your body. Also, wind-resistant clothing is not as effective as windproof clothing for this purpose. Sun Protection. A quality pair of rain pants should also offer some protection from the sun. This type of clothing has an ultraviolet protection factor (UPF) rating that will assist in protecting the skin against the sun’s damaging rays. In the next section we will show you some of the things you should also consider and look for when shopping for a pair of rain pants. When selecting the right pair of rain pants, there are many factors to consider, and several things you should always look for. Below we have listed several of these factors. In addition to needing a waterproof or water resistant fabric, you also want a material that can breathe, either through the fabric itself or from some added ventilation features added to the rain pants to help them breathe. Breathability is a major concern when buying rain pants. If you consider the manner in which rain pants are worn—typically over your hiking pants, shorts or other outdoor apparel—it is not too difficult to figure out that rain pants can quickly generate heat to the bottom half of your body. Not only does this make for a very uncomfortable experience, it can cause your lower body and legs to heavily perspire, severely dampening the pants or shorts underneath the rain pants. This defeats the original purpose of the rain pants: to keep you dry and protected from the wet elements. Pants soaked in perspiration can also lead to uncomfortable rashes in some cases—rashes that can make it painful to walk, hike or enjoy other fun outdoor activities. When it comes to breathability, Gore-Tex is a new age material that is very breathable in nature. As such, many of today’s best selling rain pants are made from this—and similar types of—material. It’s important to remember that most major manufacturers of outdoor apparel have their own technologies and labs in which they test certain materials for things like water resistance and breathability. These tests lead to proprietary practices and methods in which these companies develop their own type of breathable fabric with which they make rain pants as well as a wide range of other apparel items. To say that it is important that you select the correct and proper size when choosing rain pants may seem to be a no-brainer. However, there are many things to consider when choosing the properly sized rain pants—factors that some people may neglect to take into account when shopping. Rain pants are not typically sized like a regular pair of trousers. The latter is typically sized in terms of waist size and the length of the inseam, expressed in terms like 36 x 32, 30 x 30, etc. Instead, rain pants will typically bear sizes like small, medium, large, extra-large, XXL, etc, much like T-shirts, sweat pants and sweatshirts. So how do you know what size you wear in rain pants? Some rain pants are worn over your clothes. Before we talk about some of the other sizing factors you need to consider, it is important to reiterate and reinforce that some rain pants are designed to be worn over your outdoor apparel/hiking pants, making it quick and easy to suit up once the rainfall begins. Because of this, you will probably need to go one or two sizes up when selecting the perfect pair of rain pants for you. Individuals who typically wear a small, for example, may require a medium or large; and those who wear a large may need to select a pair of rain pants that is marked XL or XXL. This is perhaps the most crucial sizing factor to keep in mind, and the number one reason for trying on your rain pants in the store before making a final purchase. And when you do try them on, make sure you try them on “over” the same type of pants you would likely wear when enjoying an outdoor hiking, camping, fishing or hunting adventure. Waist type. Most rain pant that you will find on the shelves of your local sporting goods or outdoors store will typically have an elastic waistband or a drawstring waistband. These options give you a lot of flexibility in terms of your actual waist size. However, be careful that you do not get a pair of pants that is too tight around your waist and hips. This can make activities like hiking, backpacking and even squatting down to light your campfire exceedingly uncomfortable. Your height and the length of the rain pants. Your height and the length of the rain pants is always a concern when selecting and purchasing these items. You are definitely going to want to choose a pair of pants that offers good coverage over your lower body when worn properly, with a little play in the height for comfort. Remember your boots. If you are like most outdoor enthusiasts, you probably wear hiking boots (or other types of boots) when engaged in activities in the great outdoors. These boots can be quite bulky, making it difficult for narrowly-designed rain pants to easily fit over them. Therefore, it is imperative that you try on the rain pants you plan to purchase while wearing all the usual apparel items—including your boots—that you would normally don outdoors. Think comfort. Last, but certainly not least, is comfort. Just because the skies may open up with heavy rain and hail, it does not mean you have to sacrifice comfort. In fact, some would say that comfort is even more important in inclement weather conditions. Hence, when sizing your new rain pants, try to make sure they are a little loose—without being baggy. This will offer the most comfort during your hiking or backpacking trip, or when pursuing one of the many outdoor sporting pursuits. We cannot talk about the size of the rain pants without talking about the weight. And when considering the weight of your rain pants, you must once again remember that these items may be designed to wear over your clothes, allowing you to put them on quickly. Because of this, it is important that you do not add too much extra weight—weight that can slow you down during a hike or force you to suffer a degree of discomfort. Fortunately, most of the rain pants you will find are intentionally designed with lightweight fabrics and materials. This is quite impressive when you think of everything these pants are designed to do. Still other rain pants are made with VERY lightweight—almost featherweight—materials. Although this latter category tends to be quite a bit pricier than standard rain pants, it may be well worth the money if you are a regular hiker. As a hiker or outdoorsman, layering your clothes is a must—something to which you will have to grow accustomed. Those that have been hiking and backpacking for years already know this trick—the trick of bundling up to start the morning hike, and shedding clothes as the weather becomes warmer to ensure comfort. When it comes to rain pants, however, these are items you will only wear when the weather is very foul. They represent the last line of defense between you and the harsh elements outside. If hikers are carefully prepared, these rain events will not come very often. As such, your rain pants will spend most of their lifespan tucked away in your pack, only seeing the light of day when the skies turn gray and rainy. With this in mind, remember that hikers and backpackers are often forced to carry with them a large amount of gear and supplies. A tent, sleeping bag, food, cooking supplies and clothes are just some of the “stuff’ you will find in a typical hiker’s pack. With all this gear, the backpack can quickly get heavy. Also, it can make it difficult to store any additional items in the pack without having to remove another important item to make room for them. Because of this, it is absolutely crucial that the rain pants you choose are both lightweight and easy to fold down into a tight little package, one that does not add too much extra weight and takes up very little room in the pack. Fortunately, most of the most renowned outdoor apparel manufacturers have taken these points into account, and have thus designed their rain pants to be very lightweight and extremely compact and portable. Some of the cheaper lesser-known rain pants, however, may be bulky, making them not only difficult to carry, but also uncomfortable to wear. These are the rain pants you want to avoid at all costs. As we mentioned above, waterproofing is a process designed to help a fabric prevent the buildup of water rather than absorb it, and it is absolutely imperative when it comes to rain pants. Currently, there are two waterproofing technologies that represent the most “common methods for waterproofing”: laminates and coating. In the laminate form of waterproofing, manufacturers add a type of state-of-the-art membrane to the rain pants that prevents any water from passing through them. However, this membrane does allow vapor to pass through it. This technique for waterproofing helps keep the water away from your body, while still allowing the rain pants to breath, thus preventing too much perspiration to form on your pants or skin. The other form of waterproofing, known as coatings is akin to adding a thin layer of paint to the inside of the rain pants—an impenetrable substance (like a water sealant) that prevents the water from soaking into the clothes. Coated fabrics for waterproofing, however, does not offer the same level of breathability as laminated rain pants, a fact that can lead to some very uncomfortable hikes and unfortunate rashes. Naturally, coated waterproof fabrics tend to be substantially less expensive than those treated with laminates. Rain pants are made with one of three waterproof fabric designs: two-layer rain pants, 2.5 layer rain pants and three-layer rain pants. 2 Layer Rain Pants. Ironically, rain pants made with 2 layer fabrics tend to be heavier and bulkier than the other two kinds of rain pants. These pants offer average to good protection against the elements. They are also the most affordable type of rain pants you are likely to encounter. 2.5 Layer Rain Pant. Rain pants—and other garments—made with 2.5 layers of waterproof fabric are very popular today. The fabric used to make these rain pants tends to be much lighter in overall weight, so even though 2.5 layers of fabric are used, these pants are somewhat lighter than the former type, and offer good to excellent protection against the elements. 2.5 layer rain pants are understandably more expensive than 2 layer rain pants, but they may be worth it if you are a regular hiker or backpacker. 3 Layer Rain Pants. 3 Layer rain pants use the most lightweight fabrics available, and the three layers of protection are designed to provide superior defense against the elements. In fact, so protective are the 3 layer rain pants that your average hiker would usually never require these types of pants, which is a good thing, as they tend to be very, very pricey. Three-layer rain pants, which are highly durable and offer the best protection, are typically worn by alpine climbers who regularly face some of the worst weather conditions. Although the seams on your waterproof rain pants may seem like the last possible item you would need to check, they are actually quite important. If you know only the slightest bit about sewing, you understand that the seam is where the manufacturers of rain pants bring the fabrics together—bring them together with a needle and thread. Although tiny in size and nature, these small needle marks can compromise the waterproof nature of your rain pants, allowing water to seep in and getting your clothes/legs underneath sopping wet over the course of a few hours. To avoid this, be sure to look for rain pants that have a waterproof seam added to the pants. Waterproof seams are usually applied to the inside of the rain pants for aesthetic purposes, and do a great job at keeping you dry when the weather turns cold and rainy. While some rain pants are designed to be worn over your clothes, keeping you ever prepared for any type of weather mishaps, others are designed to be worn alone. Some of the pants in this latter category have convertibility options—options that allow you to change the length of the pants in an effort to keep you more comfortable in warm weather. Rain pants that have these features can usually be converted in one of two ways: roll-up and zip off. Roll Up Rain Pants. As the name suggests, “roll up” rain pants is a style in which the leg of the pants can be rolled up to Capri length or Knee Length. Once rolled up, the rain pants can be secured in that position using a snap or a button, ensuring they remain in that designated position. Zip Off Rain Pants. Zip Off rain pants work a little differently than the roll up type of pants. With these pants, the lower part of the legs can be zipped off when the weather turns warm, effectively transforming the rain trousers into rain shorts. The type of convertibility you select is entirely a matter of preference. Some prefer the zip off style of pants because once the lower part of the legs has been removed there is no more fussing to be done with them. However, with zip off pants it is necessary to remove your pack and stow away the zipped off portion of the pants leg. The roll up style of pants are the choice of others, as they offer some quick, easy, and on-the-go relief from the heat while keeping the rain pants entirely intact. No list of rain pants factors would be complete without mentioning price. However, price should NEVER be the only factor you look for. As the old saying goes, “you get what you pay for,” and the same holds true for rain pants. Truth be told, price should be one of the last factors you should consider, coming only after you have considered what you specifically need in your next pair of rain pants. If this means having to pay a little more for a superior product, so be it. At least you can rest easy knowing you will not soon have to replace a defective product that did not offer the benefits it claimed. Lower leg zips. Lower leg zips on each side of your rain pants will enable you easily take them on and off when the rain comes and goes. Instead of having to sit down and remove your boots—in the wet mud—side zips enable you to place the rain pants directly over your boots and other clothing without ever having to sit down and risk getting soaked. Ventilation Zips. Ventilation zips, usually located about midway up each leg of the rain pants, add an extra measure of breathability to the rain pants, keeping you protected from the elements while also keeping you cool and comfortable underneath. 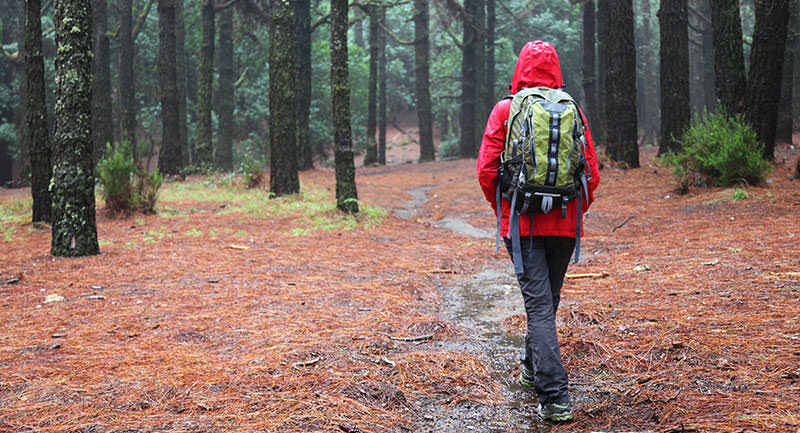 By following the guide above, selecting your next pair of quality rain pants should be a walk in the park. Whether you are a regular hiker (or camper, fisherman, etc) or someone who enjoys the outdoors just a couple times a year, a good pair of rain pants is an important item to keep in your pack. Although you may rarely need them, it’s always good knowing they are stowed away for when you actually do, as there is nothing that can ruin a hiking trip faster than sopping wet clothes that might take forever to dry. Night Vision vs Thermal Imaging: Which Is Better For Hunters? Fixed vs Variable Scope: Which Is Best For Hunters?